My children had the chance to review the newest book from Melinda Johnson, Piggy in Heaven. This is a small little board book filled with bright, colorful images and simple, gentle language that belie its true depth. It is just a little board book but it also a very handy tool designed to help very small people deal with very big losses. This is a book about the death of a beloved pet guinea pig named Piggy, one that the author’s family once owned. I believe that it is critical to teach children both to love and to grieve. If we are unable to one we will never be able to do the other and there are people, dreams, hopes, and even animals which deserve both. For many children, their formative years will be punctuated by death and learning how to live with it and through it is an important skill because all life is temporary. Nothing lives forever. Like all things that children must learn, grief is a part of the landscape of living. In the story, Piggy finds perfect natural happiness with health and vigor and grass and daisies and even friends. Piggy is not alone. This is critical. Children see their pets needing themselves as much as they need their pets and the fear that the pet will miss the child can be upsetting. Piggy is happy which is as much as any child can ask. Last night, I read this book to my children, all of them heaped around on the sofas, the two youngest in my lap. My eight-year-old, Sophia, liked the story so much that she immediately read it again to herself. She told me that she thinks this is an important book because kids will lose their pets at some point. They need to have this book so that they already have it when they lose their pet. She is not wrong. My youngest, Claudia, is not yet six. For her this book was evocative. It reminded her of her cat’s death two Christmases ago. Sadly, it is pretty much her earliest memory. She struggles occasionally with remembering his death. We have a new young cat but it is not her elderly cat whose only goal in life was to lay close to Claudia and be stroked. I think it is worth mentioning that some children might find this a difficult book to read; not a bad read, just hard. That’s okay. It is important to work through these feelings so that we are prepared to work through even bigger ones down the road. Thinking about this book today, she is glad that she read it and still thinks it is a good book to read but wants other children to know that it is okay if it makes them cry. She is also not wrong. Sometimes kids need an opportunity to cry and if this book helps with that, then it is still helping. The book is published by Paraclete Press and is available from their website HERE as well as other major retailers. I received a free advance copy of the book with no obligation to review or give a positive review. The thoughts expressed here are my own or those of my two youngest children. I wholeheartedly recommend this book and I am so glad that I had the opportunity to read this with my children. 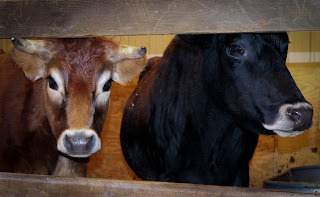 My family's cows in the barn in the thick of winter. When Cheryl Anne Tuggle approached me to review her book, it seemed like an obvious good match. I milk cows, am writing a book on farming, my husband is a deacon attached to a monastery, and I like to read books. She wrote a book about a small homestead, one that produces dairy, and with a monastery nearby which figures prominently in the lives of the characters. The book also has cows which I like as much as I like books. unfussy language that belies its depth and cooperates with the particular voice of the main character. himself evolves and becomes more of himself. The story is gently told if not gentle in itself. It revolves around a small family living simply on a little homestead intending to meet their own needs which do not include excess and modernity. There are many losses in the early part of the book, ones I will not deprive you of engaging, and one of them comes full circle in a beautiful way but these are only the beginning of losses to come. Jess believes he will find himself in the barn and the life his father has laid out for him but when he is an adult, he realizes that he must actually find who he is meant to be and it is not the man he thought he would become. This sets up his entire life, a continual process of peeling away the layers of pretended identity to find what lies beneath, what was always there but was hidden. This is very much a character-driven work and the character driving everything, and being steered through his metamorphosis, is Jess. What drives Jess are the losses he endures and learning to keep getting up in the morning despite them, to feed and water and milk cows that depend on him entirely. Cheryl Anne’s way of narrating Jess’ profoundly deep pain isn’t overly flowery and cheaply piled on but is restrained and allows the reader to fill in the gaps. She uses a steady handle to pour out her words in a measured way that gives greater gravity to the moments. The result is an evocative story that cannot help but be a classic. Her book is one to return to again and again to be reacquainted with Jess as he is and who we are in that in that particular moment we seek him. The seminal event is that which is referred to in the title, the lights on the mountain. In Orthodoxy, we remember the “uncreated” light on Mount Tabor which is the human perception of the radiant Glory of God. It was a blazing light, blinding to look at, but one could not look away. This is like the lights on the mountain in the titular event. What came after for Jess, and for the followers of Jesus, was seasons of pain and suffering and a messy sort of beautiful glory. When you come to the end of the story, I want you to remember that Galina, a very significant name in this story, means light. Grace comes in with light. The book opens and closes with light and what comes after is a messy sort of glory but it is glorious nonetheless. If you look for the light, you will find grace. This book is available from Paraclete Press (HERE) and from your regular books sources and you should definitely buy it. I was given a free review copy of the book but was not otherwise compensated in any way for my review nor did I promise to give a positive review. The thoughts expressed are my own.